Used to protect and keep all the tools safe. 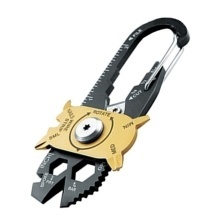 Compact and handy, portable and for pocket tool, easy to take. Tools include six models spanner, bottle opener, cutter, measuring tape, nail file, pry bar, wire strippers, large and medium flathead screwdriver, glasses screwdriver, medium and small Phillips screwdriver, spanner bicycle elastic article including a variety of tools.